Storing dry canola for a short duration is the best way to use harvest bags under Prairie conditions. Dry canola seeds can be stored for up to eight months and 12 percent moisture content canola can be stored for up to five months without any significant change in quality or grade using harvest bags during autumn and winter. Canola above 12 percent moisture should be stored for only three to four weeks in the harvest bags to avoid quality and quantity losses. Digvir Jayas with the University of Manitoba led the study. 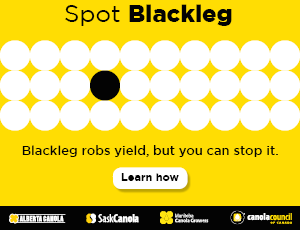 For the first year, canola of eight, 10, and 14 percent moisture was loaded into the bags in October 2010 and unloaded approximately 10 months later. Samples were collected every two weeks. Seeds with eight and 10 percent moisture had not changed significantly in quality over the 10 months. Canola with 14 percent moisture had germination drop to below 50 percent and fatty acid value (FAV) double after 16 weeks. For the 10 percent moisture seeds, germination for canola at the top of the bags dropped below 50 percent after 24 weeks. This is because of temperature and moisture migration inside the silo bags. In September 2011, the second year, three 70-foot-long bags were loaded with 12 percent moisture canola. The bags were unloaded sequentially at five, seven and 11 months. Germination remained above 70 percent for up to five months of storage, and then declined to around 50 percent. Commercial grading at the elevators indicated no loss of grade after five months. But canola seeds lost one grade after seven months. After 11 months, which included the hot summer months, the canola was graded as “feed”. In October 2012, the third year, canola seeds with 12 percent moisture were loaded into three 70-foot bags. Two silo bags were damaged in a vandalism incident in November, leaving only one bag. Seed samples, CO2 and temperature profiles of seeds were collected at four different locations along the length of the bag. Seed samples were collected every two weeks using a standard torpedo probe to check moisture content and quality. Temperature was measured every 30 minutes, and CO2 samples were collected every two weeks. Third year results showed higher moisture content at the top of the bag. 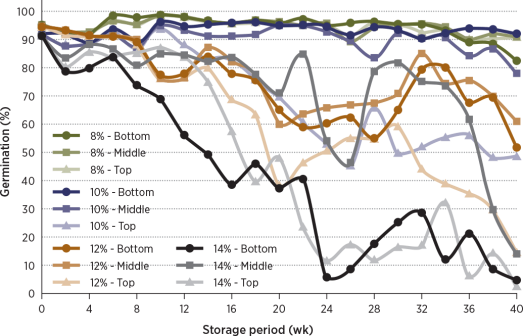 Daily temperature fluctuations, temperature gradient, and convection inside the grain bag might have caused moisture migration or condensation at the top. CO2 remained constant for most of the storage period, indicating air tightness of the bag. Increased CO2 and reduced O2 concentration after 28 weeks indicated some biological activity inside the bag in the summer storage period. Published: “Feasibility of Storing Canola in Harvest Bags (Silo Bags) under Western Canadian Prairie Conditions: Preliminary Results”. In the Proceedings of the CSBE/ SCGAB 2011 Annual Conference, Winnipeg, MB, 10-13 July 2011. “Harvest Bags for Grain Storage: An Overview and Review of Current Research”. In the Proceedings of the 3rd International Conference on Food Technology, IICPT, Thanjavur, TN, India. 4-5 January 2013.